Tim O’Rourke has been to gracious to stop by the blog to answer some questions for my in regards to his three novels AND to also offer a giveaway!!! So without further ado, I give you Tim O’Rourke! You’ve written three really amazing novels: Black Hill Farm (Book 1), Black Hill Farm: Andy’s Diary (Book 2), and Zachary Black and the Doorways to Endra. What led you to write these novels? What were your inspirations, if any? With Black Hill Farm book 1, I wanted to write a paranormal romance but without vampires or werewolves. I thought this had already been done in so many other books. So I needed something else. I wanted something creepy without there being monsters. As so often in real life the monsters are people and I liked that idea. People often make better monsters as they are real. I wanted the same in Black Hill Farm book 2, but wanted to explore this idea further – so I made my monsters people in authority – those that in everyday life we should be able to trust. For me that is scarier than any vampire or werewolf. Those that exploit their positions of authority are the scariest monsters of all. So that was the premise of my idea and I built the stories around it. I also wanted to write some strong and feisty female leads, which weren’t always looking up to and seeking protection from the guy in their life. I tried to do this with Andy. I wanted her to be the strong character and have the mystery surrounding her. It’s Andy that is the fighter – the survivor – the one that takes charge and comes up with the plan to save her and Ben. This is also true of Neanna in Zachary Black. She is as strong as Zach and this is seen during the battle at the end of the book. Again it is Neanna who saves Zach from his Uncle as they escape from the hospital. Zach’s sister Anna is also as strong as she escapes from her uncle. Willow, the female werewolf in Zach Black, is also the one chosen to go into Earth to find the league of doorways. Zachary Black was written for my two teenage sons. They were always complaining that they didn’t really find books exciting and the draw of the PS3 was just too great. So I decided to write a real swashbuckling adventure and I tried to fit in as much adventure and action as possible. But I really got the idea while watching Monsters Inc. with my three year-old son Zachary. I just loved the idea of all those doorways leading to different rooms and each door was unique. As a teenager, I loved watching Clint Eastwood’s westerns. I couldn’t think of any books written today for young adults that were in part set in the Wild West so I wanted to incorporate some of that into my story and bring that genre back for YA. And that was really the spark of the idea that led to Zachary Black & The Doorways To Endra. The Black Hill Farm series are psychological thrillers that blew me away, especially all the twists and turns and the interactions between Andy and her cousin Ben. Was it difficult to create all the twists and turns, keeping the reader in so much suspense? Like Detective John Taylor in the book – I viewed the whole thing as a magic trick. Bit by bit revealing the trick along the way. Letting the reader get closer and closer to the action and not revealing how the trick was done until the very end. I knew the ending of the story, but what was difficult was just revealing enough so as not to give too much away but give enough to keep the reader hooked. Believe it or not one of the biggest twists in the book, I was actually going to write out, but was persuaded by my wife to keep in. I worried that the reader wouldn’t go for it – but it’s the one that seems to catch everyone out the most – so I’m glad that I kept it. It was hard to manage all that – but I hope for the reader it seems seamless and they are unaware of the planning and thought that went into it. Like a good magic trick –it seems slick and simple and that’s what amazes the audience. 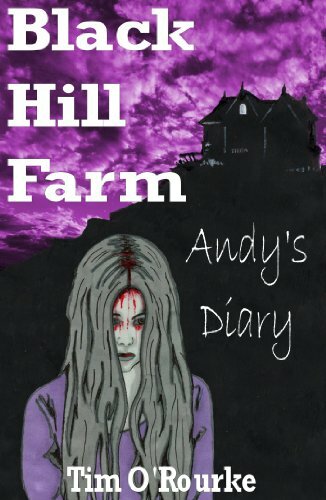 Black Hill Farm: Andy’s Diary (Book 2) provides the “other side” of the story in regards to Black Hill Farm (Book 1). Why did you decide to write the second book this way? After finishing Book 1, I noticed that the reader had a downer on Andy and they believed that she was bad. I don’t think people are born bad – I think they get turned bad, and characters in books that are purely evil just for evil’s sake are never very interesting. They are much more fun if we get under their skin and see the situation from their point of view. Therefore I wanted to show the reasons why Andy was the way she was. Like John Walker said, she was like jelly and ice cream that somebody had poured gravy on. They had taken something that should have been nice and sweet and ruined it. I wanted to show the reader who had ruined her and why. I also wanted to show how Andy felt about the dinner party with Parker, how she felt about spending all that time locked in the room with her dad’s corpse. I knew the reader would have come to their own conclusions from book one, but I wanted to give Andy the chance to tell her side of the story. I really enjoy the way your Black Hill Farm novels are written—as police transcripts of interviews. Was this a difficult style of writing to master? Did you have to do much research in regard to police transcripts in order to “get it right”? I used this style for two reasons. Firstly, I love dialogue, it helps to get to know the characters and I like quick fire dialogue. I think it speeds things along and can be dramatic. Secondly, it’s a style that I’m used to as I’m a police sergeant in the real world. This is something that I don’t often talk about as I don’t believe it to be relevant to my writing – but in this case I think it has some bearing. I have used the exact same format that I use during the course of my duties, except obviously everything in BHF 1 & 2 has no bearing on any case that I’ve worked on or come across. But as I was writing a book that was made up of police interviews it was definitely a help to have that experience and knowledge to draw upon. Is there a specific character that you identify with in the Black Hill Farm series, or your novel Zachary Black and the Doorways to Endra? Who/Why? From the Black Hill Farm books, I guess that I identify mostly with the Detective John Walker. Apart from the obvious fact we are both police officers, I like the way that he is only interested in facts and won’t open his mind to the possibility that there might be something else out there. I think he is quite a sensitive guy and always wants to follow the rules. Except in his personal life he hasn’t kept to the rules and his secret is revealed at the end of the book. I like the conflict that he is struggling with. From the Zachary Black book, I think I identify with William the most. Apart from being incredibly hairy as a teenager and having to start shaving way before any of my friends, I like the way that he is desperate to do the right thing by his family and friends although he gets this wrong. William has a strong moral compass although he sometimes goes about things the wrong way. My knowledge of police procedure, custody blocks, etc., are all areas that I draw upon to make my stories believable but the stories are all made up in my head. I guess if I’m to be honest, there are bits of me in John Walker although the character is older than me. The farm in is a real place although the name is different in real life. It’s a place that I used to stay on family holidays as a boy. The town is real but I changed the name to Beechers Hope. 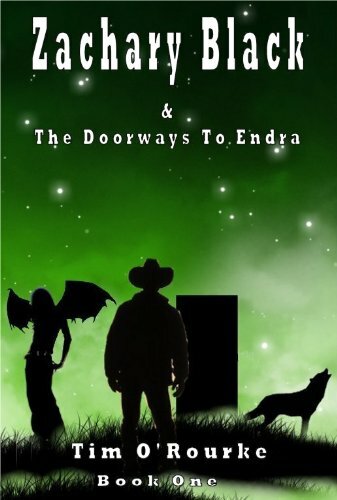 Zachary Black and the Doorway to Endra juxtaposes two worlds that mirror each other. As the characters move from one world to another, they automatically change clothes, and sometimes form—which was an ingenious and interesting aspect of the story. Was it difficult to write these juxtapositions and keep the story flowing? In many ways, writing Zachary Black was harder to write than BHF. There aren’t as many twists, but writing about supernatural characters that change form, etc., is difficult. I didn’t want them to be cartoon characters but have real feelings and emotions that the reader could identify with. That’s why I had William (Werewolf) having to make amends to his father and seek his forgiveness – we all want forgiveness at some time or another in our lives. Neanna (Vampire) wanted revenge for the murder and betrayal of her race. Tanner was not only a police officer in Earth but a peacekeeper in Endra who was in search of his lost love Meadda. Even Fandel was haunted by the bullying he suffered at the hands of his tormentors at school and university. Apart from having to give all these characters some emotional depth, the world of Endra had to be real as well. It wasn’t good enough to have different kinds of fruit and animals – Endra had to have some history like it had been there for centuries. That’s why there are references to things like the Battle of Nef that had happened hundreds of years before, the cathedral Knights being hundreds of years old etc. All of this I hope would make Endra seem as real as Earth. All of this had to be revealed subtly and it was hard to do. I didn’t want to draw big signs to it as if saying to the reader “Hey look how different this place is to Earth” – if that makes sense. Is there anything specific you hope readers take away from your novels? I hope readers will take from Black Hill Farm the sense of passion that you feel the first time you fall in love. How you feel that it is the most real feeling in the world. I’d also like the reader to think about how far they would go for the person they love most in their life. Would they go as far as Ben did for Andy – so he could stay with her? Would they give up their freedom like Andy did to stay and help her dad on the farm? Would they stand back and watch the cruelty that Andy’s mum went through? Even Walker who spent his life following a set of rules broke them for his wife. All of the characters in BHF lost out one way or another. The same can be said for Zach Black – he goes on a dangerous journey to save his sister. William will go to the end of two worlds to seek his father’s forgiveness and approval, and Neanna puts her life constantly at risk to seek revenge for her race of people. Which one of your novels was the most difficult to write? Which one was the easiest? Zach Black was the hardest book to write. I had to create a whole new world with creatures, different races, games, foods and everything else that went into it to make it believable. Nothing was already there – it all had to be created in my mind. Black Hill Farm was the easiest – despite all the twists, I had a wealth of experience to draw upon. I write in the kitchen usually with my three year old son tugging at my arm to go and watch cartoons with him on the T.V. It is difficult to find time to write as well as holding down a demanding job and spending time with my family. I tend to write in blocks – so when I’m working on a book, any free time that I get I spend writing. Once the book is finished, I then put the laptop away for a few weeks and concentrate solely on the family. When I am working on a project, I go full at it. I try and write 2,500 words per sitting. This is usually when I get home from work or before I go to work – depending what my shifts are. On my days off I try and write between 5,000 to 7,500 words in one sitting. BHF 1 took me twenty days to write. But that doesn’t include the time spent editing. I usually do three drafts. Anything more than that and I think the work loses some of its spontaneity and can go stale. There are still mistakes though and they drive me mad. It’s almost that you become blind to them because you’ve read the work too much. I keep note books with future ideas for stories. 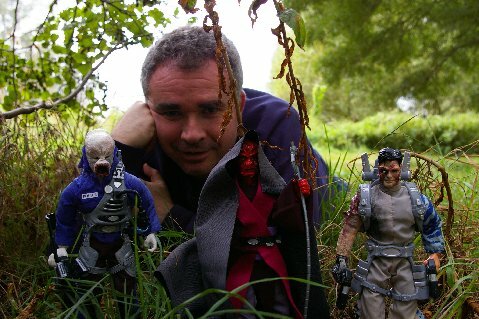 I also do sketches of characters and sometimes I sculpt the figures so I have a three dimensional image of them. This often helps if I’m writing about a particular monster or creature. It works as a visual reference. My house is littered with note books, sketches and weird looking creatures that I’ve sculpted. As a kid I really struggled with reading and writing. In fact if it didn’t involve painting, drawing or making things with my hands, I wasn’t very good at it. The problem was my head was always filled with ideas and stories. I would always be telling my friends and family my stories, but I was frustrated as I couldn’t write them down. I was in remedial for English and struggled to put even the basic of sentences together. So I would express myself through drawing and painting but it was never enough – I wanted to write my own stories! Then one summer – I was about thirteen I think – I went with my family on holiday to that cottage as described in Black Hill Farm. It was about a 400 mile drive; so on the way we made plenty of stops at service stations along the way. My brother who was younger than me by three years was a confident reader and he was bought a book to read on the journey. I pestered for one but was told no as it would be a waste of money. In the end I got my own way and was bought one of those Fighting-Fantasy role-playing books. It was made up of nice neat sections which weren’t too long and it was more of a game than a book. Anyway, I read that book during the holiday. I then pestered for another which I read, then another and so on. Suddenly reading had clicked with me and I couldn’t stop. Once I had mastered the reading the writing followed and at long last I started to write my own stories. The freedom I felt was truly amazing. Every spare minute was spent either reading or writing my own stories and I started to improve at school. I got moved out of remedial and by the time I had left school I had passed my English exams and then went on to college to study English Literature, Drama and Art. It was really like reading and writing had saved me. I had this wonderful English teacher and if the weather was nice she would take the class up onto the school fields and read my stories out loud for my friends to hear. I found this embarrassing but secretly enjoyed it too. I was lucky as I had a friend of the family who would spend hours going over my stories with me, helping me with my spelling and grammar etc. Once I got to college, I wrote some plays which were performed by the drama department and that was magic too. So I guess, by the age of thirteen, I knew that I wanted to spend as much of my life as possible writing about all those characters and places that I could see inside my head. Do you have a favourite author or novel that you recommend your fans read? What are you reading right now? This is a difficult question as my reading tastes are so broad. I love anything from Sir Arthur Conan Doyle to Dr Seuss. I read anything from Wuthering Heights by Emily Bronte to George’s Marvellous Medicine by Roal Dahl. It’s really hard for me to pick a favourite author but if I was pushed I would have to say Conan Doyle. I love Sherlock Holmes and think he is one of the best fictional characters ever dreamt up. If I had to recommend a book, give Momo by Michael Ende a go. It’s not a very well known book, but it’s amazing. Also read Skellig by David Almond – that book is incredible. And if you want some fun, read Horton hears a Who by Dr Seuss. What am I reading right now? The Lair by James Herbert. What are you currently working on in terms of novels? 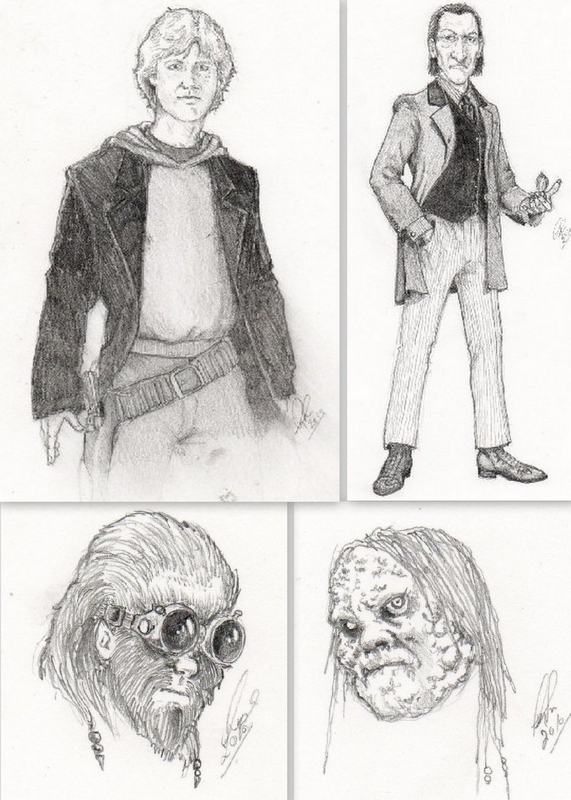 What can readers expect in the Zachary Black series? I’m currently working on a YA dark romance called The Rugged Shore. 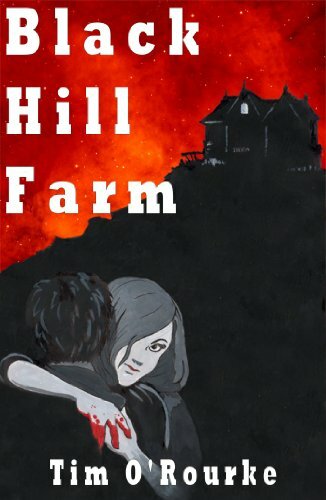 It’s darker than the Black Hill Farm books and is about two sixteen year olds (Samantha & Tom) who find the body of a boy in a lake and how this affects the rest of their lives. Unlike BHF, this book follows the two main characters into adulthood, up to the age of twenty-six. Again there are plenty of twists and both characters make decisions that have a profound effect on them and those around them. I’m hoping to have the book available by the end of June/early July. As far as the Zachary Black Trilogy goes, I’m starting work on the second book as soon as The Rugged Shore is finished. I have it written in note form, but needs fleshing out. It should be available in the autumn and the final part early in 2012. What can you expect from the rest of the series? Zach and Neanna fall in love – but does it last? Zach finds out what really happened to his parents. There is a traitor amongst them and their identity is revealed. There is a race of mechanical men yet to come and more and more modern technology keeps turning up in Endra. But why? And how? But some of the biggest surprises will be discovering where and what Endra really is and the biggest surprise in the Zachary Black books will be finding out what Caroline Hughes from BHF was doing out on the road that night when she got hit by the car. This is a bit of a spoiler so skip this bit if you don’t want to know, but there is a link between BHF and Zachary Black. Some clues: Constable Moody is in both of them. In BHF2 he talks about being suspended from the police because he failed to investigate the disappearance of a boy that ran away from his uncle. In Zachary Black, Fandel goes to Constable Moody to report Zach missing. Both books mention ‘The Great Wasteland Railroad Station’ in the desert. Anna finds it deserted after fleeing her Uncle Fandel and Detective Walker ends up there. In the very last line of BHF 2 Walker says that before stepping through the doorway he looks back to see Caroline one last time. And all the main characters have the surname Black! There are other subtle clues to look out for – such as both series of books are set in a desolate cottage/farmhouse near the edge of a cliff face. Both are set in Cornwalland a lot of the characters from both books make references to “doors” or “doorways”. For example, Detective John Walker tells Richard Jones that he should read Andy’s diary as it will open all sorts of doorways for him. There are others but it will be fun to find them yourself. That’s it; I won’t say anything else as I don’t want to spoil it for you. But I hope it will be worth the wait. Ha! Thanks Shana for the interview. I’ve really enjoyed it. Thank you Tim!!! I am excited to have you on the blog and have really enjoyed getting to know more about you and your wonderful books! !